If you face access local only problem in Windows Vista and fail to access Internet or other networking devices on home network, you can try following tips, maybe can help you solving the problem. Of course I will assume you have installed the network card’s driver correctly, no matter it’s Ethernet network or wireless card. If you are not too sure on how to check network card’s driver status, check out this network card driver status article. If the driver is not installed properly, uninstall the driver and reinstall it. If possible, go to manufacturer’s website, download and install the latest driver. Proceed to type ipconfig /all in command prompt (cmd.exe) and see whether it displays correct IP, subnet mask, gateway and DNS server info. - The BROADCAST flag in DHCP discovery packets is enabled by default in Windows Vista, but some routers do not support DHCP broadcast flag and so not able to assign IP address. You can follow the instruction here to disable the DHCP BROADCAST flag in Windows Vista and test again. - Ensure that you have enabled DHCP setting properly and configured big enough IP range to assign as well on router. - Can try to manually configure IP address and other network info on network card and see whether it works. - If you are using wireless router, go to router’s configuration page and check any enabled MAC address filter. If there is, ensure your wireless adapter’s MAC address is allowed to connect to wireless network. - Recheck the network card or wireless card configuration and make sure everything is configured properly. - Windows Vista will power off network card when it’s in standby or sleep mode, but sometimes fails to activate the network card and connect to network after waking up. 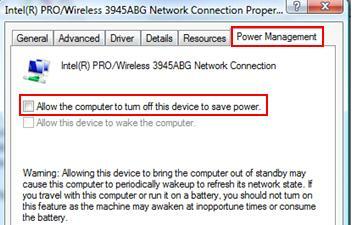 Therefore you can go to network card’s properties in Device Manager, go to Power Management tab and uncheck this feature and restart your computer: Allow the computer to turn off this device to save power. - Disable and then re-enable the network card. - Disable IPv6 feature if you are not using it. Return from "Tips to Solve Access Local Only Problem in Windows Vista" to "Home Network"! !